Altarboy: “Ad Deum qui laetificat juventutem meam. My late mother, bless her heart, never would allow me to just say “the Mass.” It did not sound reverent enough, I suppose. If she were here to read the above paragraphs, she would carefully correct me, “Vincent, it is the Holy Sacrifice of the Mass, not the mass.” Now that’s Roman Catholic! Evidently, it did not matter that I might have been thinking capital “M” when I said, “the Mass.” Mother wanted to make sure I was a good, God-fearing boy who spoke and thought within the proper ontological framework. I understood what she meant. For ultimately I believed as she did. It was through faith in Jesus presented in this Mass that we went to God for youthful joy and so much more. Joseph smiled brightly in return, gave me hug, and said he was going back to bed. I was glad because, in more than one way, he enabled me to finish writing to you on youthful joy. Previous ArticleWhich Came First: The Chicken or the Easter Egg? Consumer Awareness or Social Justice? Thank you, Mr. DePalma, for a beautiful story. If you don’t have youthful joy, you truly have nothing. Vince, thank you for sharing your deep love of God with us on Catholic Lane. 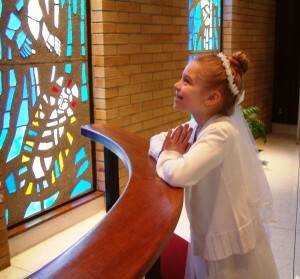 And for sharing this luminous picture of your daughter, Rebecca, receiving Our Lord in the Eucharist for the first time. We hope this is only the first of many times we see your byline here on the Lane.